A colour slide of a bridge over the St. Lawrence River. In this view a person can be seen sitting facing the camera and a boy is looking up towards the bridge. The Thousand Islands are located in the Saint Lawrence River and straddle the Canada-United States border. 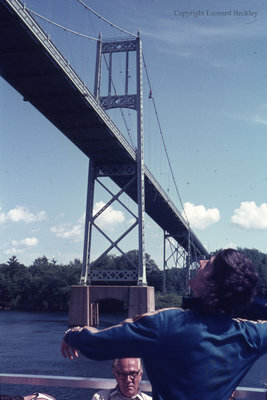 Bridge Over the St. Lawrence River, June 1976, Leonard Beckley. Whitby Archives A2014_004_028.